- Metal landscaping staples can be utilized for a multitude of outdoor needs and landscaping projects. - Use it for anchor down gardening fabric such as weed barriers and blockers, covers for raising beds, lawn seed mats, synthetic grass erosion control blankets and tarps. - Fasten and direct sprinkler hoses, irrigation controller wires, mist lines, water drippers and drip tubing, lighting and electric cables (for holiday decorations, solar LEDs, spotlights, low voltage lights and more). - Great for securing mulch rolls, artificial grass, plastic plant covers, deer cages, sprinkler valve covers, deer netting, the bottom of chain link fences, pet dog and invisible fences, vapor retarders, and check wire. - Helps hold any perimeter or area boundary in place. - Excellent as tent pegs. - 6 inch long staples drive deep enough to stay in the ground, securing your items from wind and critters. - 11 gauge steel that won't bend or flex easily when installing. - Decorative crown provides a charming flair. - Hot dipped galvanized steel with a thick layer of coating that won't rust. 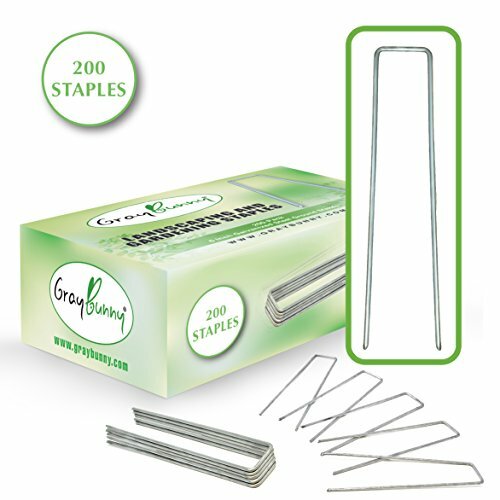 - Staples that can be re-used over and over and will last a lifetime. - Sharp tipped pilot ends to help with ground penetration. A rubber mallet should only be required for tough soil. - Designed by the brightest minds, utilizing only the highest quality materials and expert manufacturing methodologies, GrayBunny offers premium products for your home and office while exceeding highest industry standards and offering impeccable customer care. If you'd like your money back within 1 year of purchase, no worries. Just ask. Click the "Add to Cart" button and get started on your next outdoor project now! VERSATILE: Metal landscaping staples can be utilized for a multitude of outdoor needs and landscaping projects. Use it for anchor down gardening fabric such as weed barriers and blockers, covers for raising beds, lawn seed mats, synthetic grass erosion control blankets and tarps. Fasten and direct sprinkler hoses, irrigation controller wires, mist lines, water drippers and drip tubing, lighting and electric cables (for holiday decorations, solar LEDs, spotlights, low voltage lights and more). MULTI-PURPOSE: Great for securing mulch rolls, artificial grass, astroturf, plastic plant covers, deer cages, sprinkler valve covers, deer netting, the bottom of chain link fences, pet dog and invisible fences, chicken wire, mesh, screens, vapor retarders, and check wire. Helps hold any perimeter, border or area boundary in place. Excellent as groundsheet, canvas and tent pegs. Use to cover topsoil or fertilizer in yards near flowerbeds, bushes, trees, shurbs, and flowers for edging & trimming. PREMIUM QUALITY: 6 inch long staples drive deep enough to stay in the ground, securing your items from wind and critters. 11 gauge hard steel that won't bend or flex easily when installing. Hot dipped galvanized steel with a thick layer of coating that won't rust. Lightweight yet strong commercial grade nail anchoring screw spikes that can be re-used for staking over and over and will last a lifetime. EASY INSTALL: Sharp tipped pilot ends to help with ground penetration. A rubber mallet should only be required for tough soil or gravel. Bulk quantity of hooks provides enough pin stick fasteners for backyard landscapers to complete various projects and installations near your home or shed turf. GUARANTEE: GrayBunny offers premium products for your lawn and garden while exceeding highest industry standards and offering impeccable customer care. If you'd like your money at any time within 1 year of purchase, just ask. Click the "Add to cart" button and get started on your next outdoor project now!